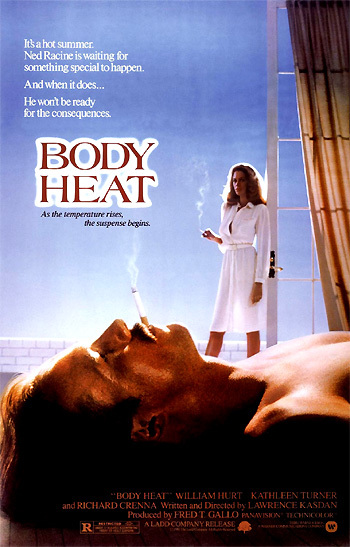 Body Heat (1981) is a dramatic, modern day film noir, patterned after The Postman Always Rings Twice (1946). It was set in the hot atmosphere of Miranda Beach, Florida. He won't be ready for the consequences. The subtitle was: "As the temperature rises, the suspense begins." The alluring, crafty, and sultry femme fatale "Matty Walker" (Kathleen Turner, who spoofed her own role in The Man With Two Brains (1983)) seduces corruptible, dim-witted, naive, and incompetent attorney Ned Racine (William Hurt), to convince him to kill her husband Edmund (Richard Crenna). "I need you so badly." "I want you right now more than I ever have!" "I'd kill myself if I thought this thing would destroy us." "You shouldn't wear that body!" She's trouble, Ned. Real big-time major-league trouble. The plot twist at the conclusion is a knockout surprise. "Matty" is killed in an explosion (identified by dental records) and Ned is imprisoned for the murder. He looks in Matty's high school yearbook and finds that she is, in reality, Mary Ann Simpson, and her ambition was: "To be rich and live in an exotic land," a wish that is fulfilled in the last image of "Matty" lying on a beach somewhere in an exotic land.